Bryan is the president of the Sinas Dramis Law Firm and is well recognized as an accomplished litigator. The majority of his clients are cyclists. 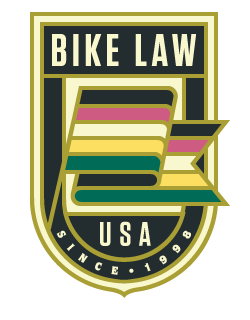 He is a member of Bike Law, a national network of lawyers who serve as advocates for cyclists, both in and out of the courtroom. In 2017, Bryan was honored as “Michigan Cyclist of the Year” by Programs To Educate All Cyclists (PEAC) and, in 2013, he received the League of Michigan Bicyclists Advocate of the Year award. Bryan has been a trial lawyer for more than two decades, litigating cases in some 40 jurisdictions. He has been named among the Best Lawyers in America every year since 2006. The National Trial Lawyers Association has also recognized Bryan as one of “The Top 100 Trial Lawyers.” In 2003-2004, Bryan served as president of the Michigan Trial Lawyers Association (now the Michigan Association for Justice). And in 2008 and 2009, he served as chair of the Michigan Civil Service Commission. Bryan’s favorite races include the Barry Roubaix Gravel Road Race and Mad Anthony Cyclocross Race. In addition to competing in races, Bryan enjoys touring and commuting by bicycle. His favorite place to ride is Michigan’s Leelanau Peninsula and his most cherished moments are those spent riding with family and friends. Bryan is well-known as an accomplished litigator and also a competitive cyclist. He races multiple bicycle disciplines and most of his clients are bicyclists. In 2017, Bryan received the “Michigan Cyclist of the Year” award from Programs To Educate Cyclists (PEAC) and, in 2013, he was honored as the “Advocate of the Year” by the League of Michigan Bicyclists. Bryan has been recognized by Leading Lawyers-Michigan as a “Top 100 Leading Lawyer” and “Top 100 Outstate (Non-Detroit Metro) Lawyer.” He has been named among the Best Lawyers in America every year since 2006. In 2003-2004, he was president of the Michigan Trial Lawyers Association (now the Michigan Association for Justice). Bryan is a board member of the League of Michigan Bicyclists, a member of the Ingham County Bar Association and a fellow of the Ingham County Bar Foundation. Joel is an appellate lawyer with outstanding research and writing skills. He is a practical thinker who helps the firm’s trial attorneys think outside the box and develop cutting-edge legal strategies. Joel became known in the cycling community for his work on the State of Michigan v Timothy Panagis case, which involved a cyclist who was cited for impeding traffic because the officer believed cyclists are required to ride to the right of the fog line. The trial court agreed with the officer. However, the Circuit Court judge reversed the decision and dismissed the citation, praising Joel’s work and commitment, stating his brief was a “$10,000 brief for a $200 citation,” referring the quality of work it entailed, not the actual charge. In fact, the firm did the work free of charge as part of the “Bike Law Defense League” program. Joel enjoys riding many local bicycle trails with his family. Bri is a paralegal at the firm. She frequently assists clients with their bicycle property damage claims and claims for Michigan no-fault benefits. As a result, she has a good understanding of bicycles and the costs associated with replacing and repairing damaged bicycles, bike components, helmets, and other bicycle-related equipment. Bri received a bachelor’s degree in psychology from Saint Mary’s College and an associate’s degree in paralegal studies from Baker College of Auburn Hills. In her spare time, she enjoys traveling, reading, and running.